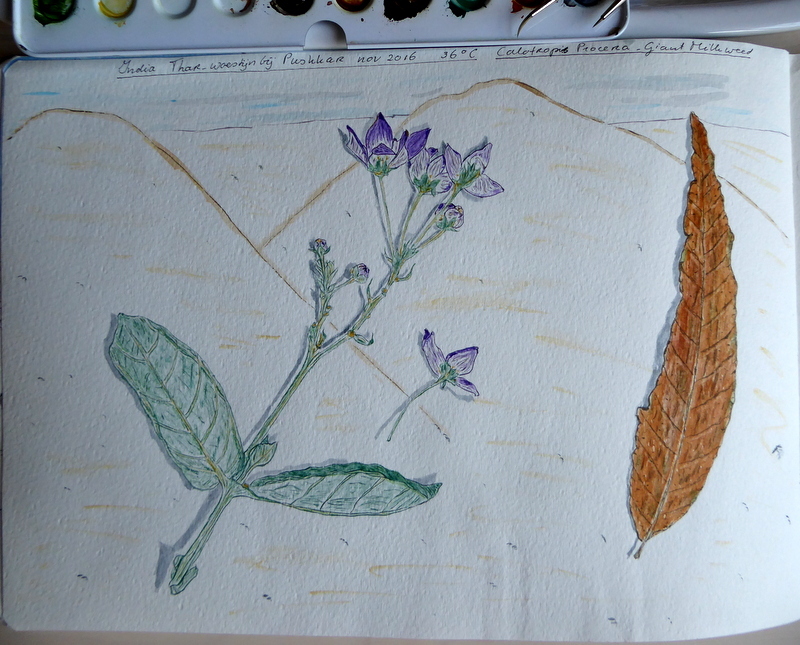 painting the life | This blog is about watercolor painting and other interests. 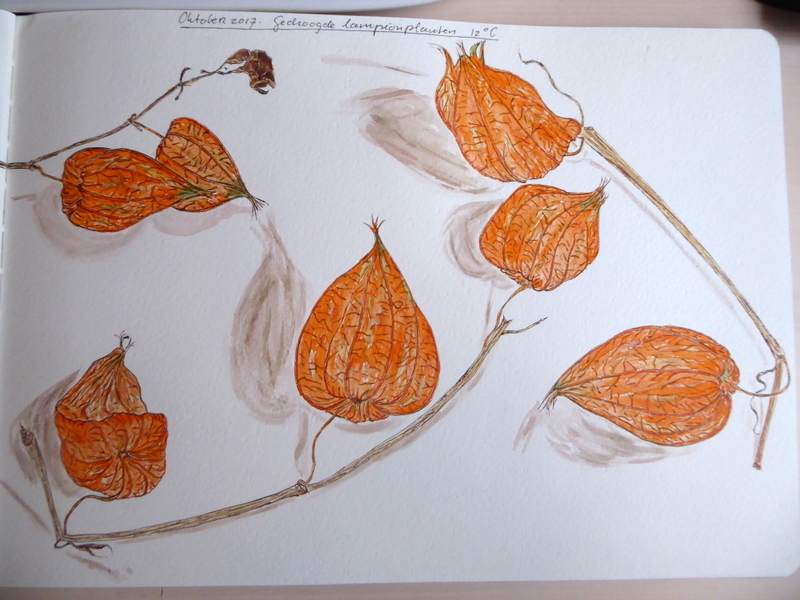 In a greenhouse in a small village nearby I found these dried botanical tulips and grass halm. Inside these tulips are tiny black seeds….given time (about 7 years if all) one could grow one’s own tulips. Anyway, my palette for these was the earth tints: sepia brown, sienna natur, burned sienna, umber natur, burned umber Terra Puzzuoli, yellow ochre and the ever faithful vandijck’s earth. 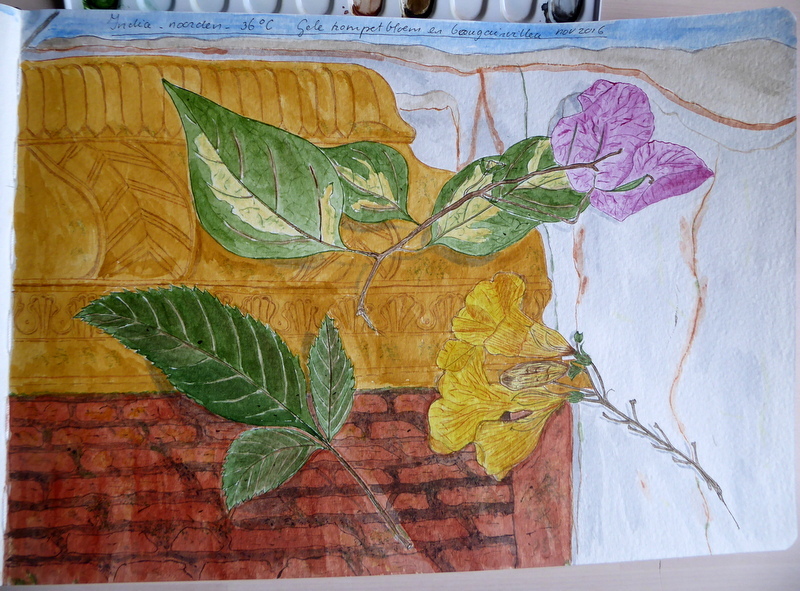 And again some dried flowers and leaf from my travels in India last year. I picked this giant milkweed which is very common in the Thar desert; it even has some green fruits on it. Not edible for human, but goat eat it. 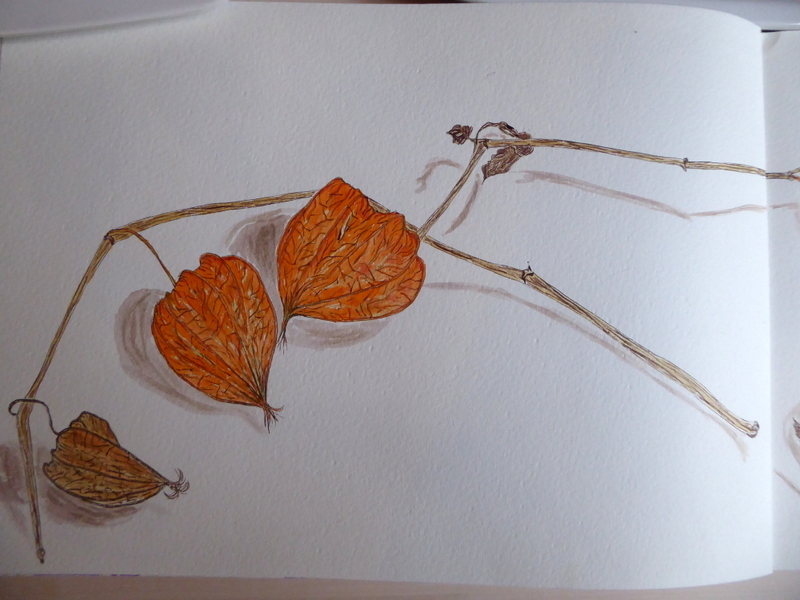 And a dry leaf. I am still in a fix whether I should paint some landscape, which is not my strong point or interest per se. We’ll see on my next journey, I guess. My colorpalette this time: strong greens as Hookers green/cobalt dark green and mauve/brilliant blue violet for the flowers. 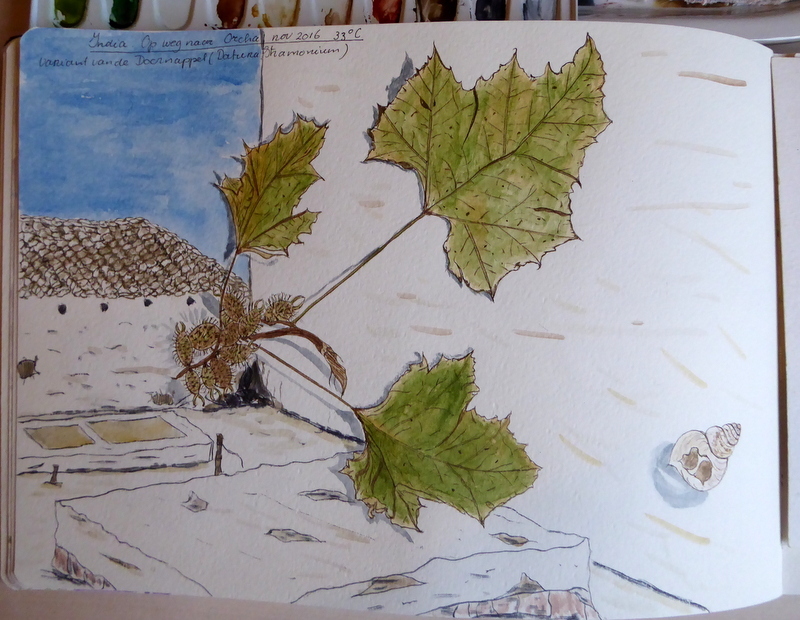 The dry leaf has some olive green/translucent brown/vanDijcks earth and burned sienna. The sky a cerulean blue and yellow ochre for the sands. Travelling in India and gathering plants. 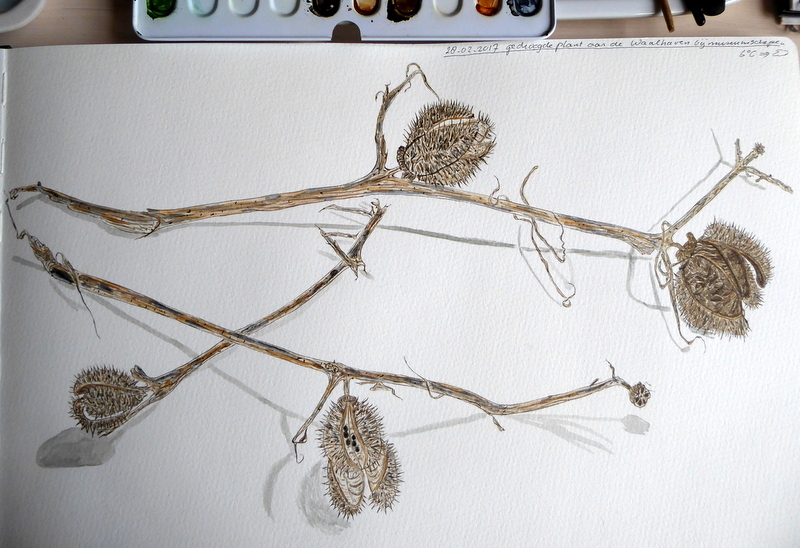 I don’t have the time to paint so I dry them in my travel-herbarium. 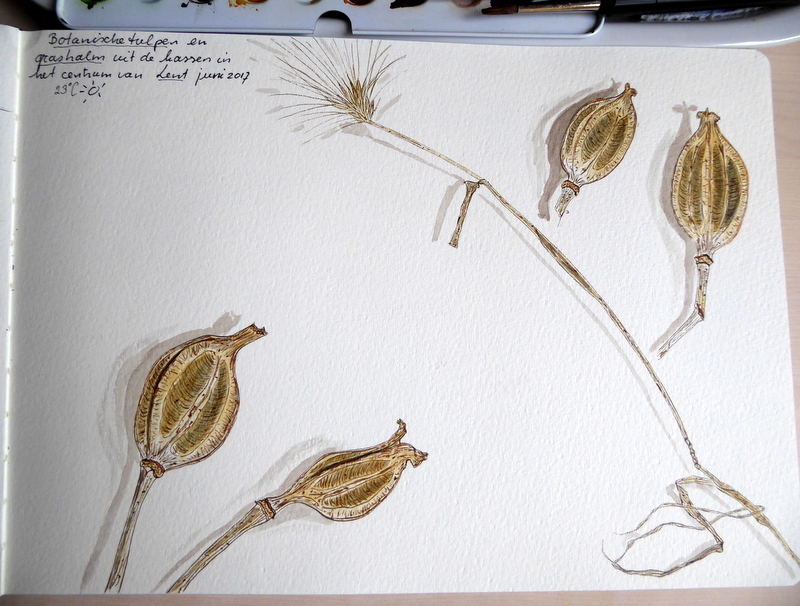 On my way from Agra to Orcha I picked some doornappel or a local variety of the Datura Stramonium. According to a knowledgable friend, there are some LSD-ish seeds in the fruits. 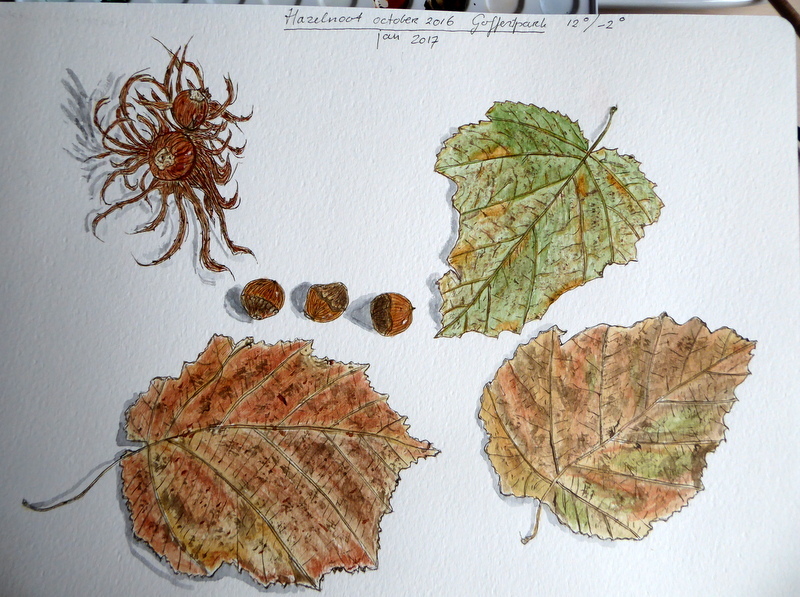 My color palette for these leaves: vanDijckearth, sap green, yellow ochre, sepia brown, sienna natur, olive green, umber natur and burned umber. 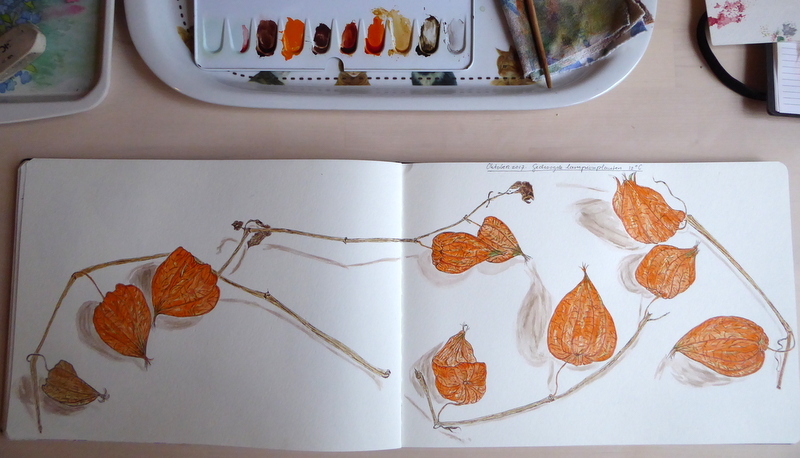 On my travel I managed to pick up some 6 very tiny pointed brushes in Udaipur, of which I am very glad. Hazelnut and some dry leaves. I picked them up in a park nearby in october, but since I’ve been travelling since then, I didn’t get around to finishing it. Lovely earth colors I used this time; walnut brown, sienna natur, burned sienna, burned umber, vanDijcksearth, translucent brown, gold brown, terra puzzolli and some olive greens.